Neil Gaiman's one of those people who was just born to write. He's written more stories than I've had hot dinners, and many of those stories have gone on to be adapted into other mediums. I've been meaning to read Coraline for a while now, especially as I love the film adaptation so much - but how could I not when it was directed by Henry Selick, the man who also directed The Nightmare Before Christmas? Now this could be a pretty unpopular opinion, but I'm going to start off by saying that I enjoy the film just a little bit more than I enjoyed the book, but that doesn't mean the book isn't brilliant. The film took an already amazing story and fleshed it out, not to mention I have something of a soft spot for stop motion films. Again, blame it on my eternal love for The Nightmare Before Christmas. I love Gaiman's stories. From American Gods to Stardust to The Graveyard Book he just has this wonderful ability for creating stories you feel as though you could step into, each with that signature weirdness that no one can quite describe but is unique to him. 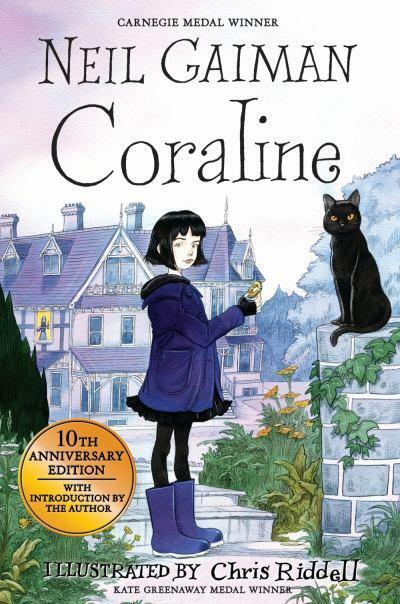 Needless to say, Coraline is another story I love; if I'd read this as a child it would have had me sleeping with the light on for weeks, because frankly the Other Mother is probably one of Gaiman's creepiest villains.